This sturdy blue and white plastic clipboard answers the question, "Do children today receive too many Vaccines?" 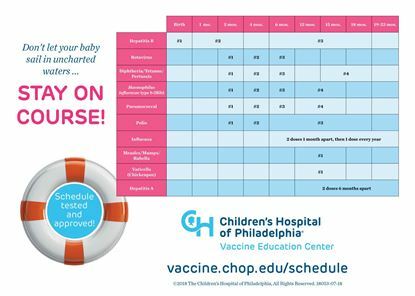 These clings offer an easy-to-read infant immunization schedule printed on electrostatic paper. Once the cardboard backing is removed, the schedule can be hung on walls, appliances and more without the use of tape or other adhesives. Discounts apply for quantity orders in the same language. $600 plus shipping per set of 1000. 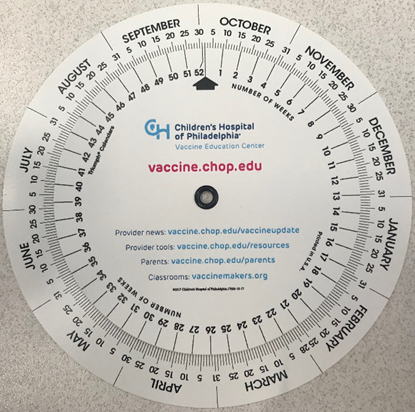 If you are interested in ordering more than 3000 clings, please contact the Vaccine Education Center at 215-590-9990. 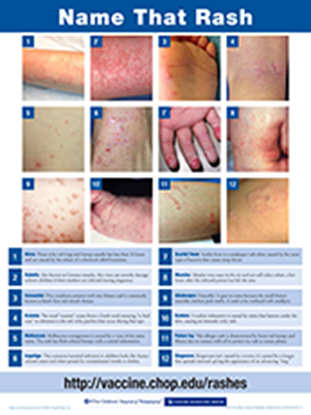 These 18" x 24" posters show 12 images of common rashes. They provide a brief description for each and a web page to get more information. $4 for set of 10 posters plus shipping.